There are three important navigation/menu bars when using Penelope. They are shown below. Note: Your bars may look slightly different depending on the level of security your user is assigned. The main screen will change depending on the activity you are performing. 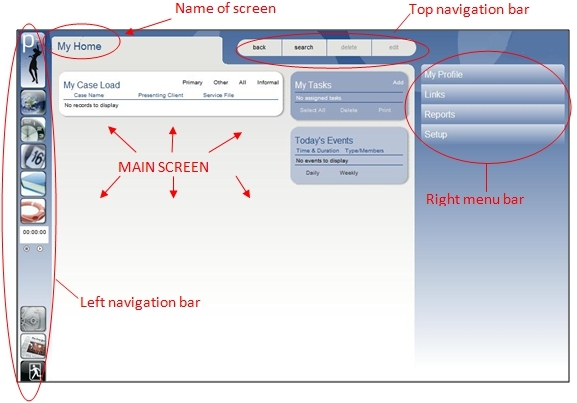 The name of the screen you are looking at will appear at the top tab, near the left-hand side of the page. The left navigation bar will always remain the same. The top navigation bar will remain the same, though there will be times when certain buttons are unavailable. The right menu bar will change according to what activity you are working on in the main screen. The right menu bar changes with the main screen. Each bar is a header for a menu of more information and links. Click on the title of each bar to view what other information is available. This entry was posted in General and tagged headings, home, icons, link bar, menu, menu bar, Navigate on June 17, 2013 by kbonot.